Every September for the last couple of decades or so, Her Majesty's Revenue and Customs has sent me a tax return. The income from my day job is taxed at source under the Pay As You Earn system, so the tax return is simply for me to declare any additional earnings. Read: book royalties. Last year I filled in and sent off my tax return, and got an official envelope from HMRC a couple of weeks later. A cheque. £33. A refund, no less. I'd paid too much tax on my day job because they'd been taking royalties into account and I hadn't in fact earned enough in royalties to offset what I'd paid in tax. A day or two later I got a letter saying that HMRC were no longer going to require me to fill in tax returns. It said, "We know you're never going to make enough money from writing to make it worth our while to chase you for tax." Well, it didn't, but that was the gist. "I'll have you know my next novel is going to be a massive bestseller!" I protested. Actually I didn't, I just felt quite pleased I didn't have to bother with doing tax returns each year any more. But I might have felt a little sad that the Inland Revenue had no faith in my writing ability. Having said that, does anyone (apart from JK Rowling) make good tax-liable money from writing? Is it, in fact, possible to make enough to live on just from writing books? Probably not, it seems. 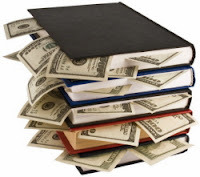 The Society of Authors estimates that the average professional (full-time, agented and traditionally published) author makes around £12,330 ($20,000) per annum. Half of all self-published authors make less than £300 ($450) per book, and among the other half the average is just £6,375 ($10,000). That's well below the income tax threshold of £8,105 ($13,000). We write for love, not for money. Meanwhile I'm keeping the day job, and rejoicing in my little tax-free sideline writing novels. I teach Seminary! I love it! Our class meets at 6.30 a.m. and because I teach via Skype I only have to get up at 6. A few weeks before I started teaching I decided to get into the habit of getting up at 6, and I found it really was the best time of day for getting all my household chores done (I work while the children are at school). In those small pre-dawn hours I did the ironing, swept and mopped floors, tidied and dusted, and I found I was dreading Seminary starting because I was loathe to give up that precious time. But you know what? Somehow despite teaching for an hour a day - and preparing lessons, and updating the group Facebook page with what we've studied so that those who couldn't make it can catch up - my housework and chores still got done. Somehow I still had time. I'm not doing Nano this year, but I do know that when we give the Lord our time, he fully returns it. I'm not doing NaNo, but I'm working hard on revising a manuscript that needs lots of help. So these are still great! Thanks! Love the quote at the end, too. So true.